There is an excellent documentary on the BBC about the debt trap aimed at very poor people, and the burgeoning loans / pawn shop "industry" that profits from it. Succumbing to such problems tends to run in families, because the children learn what they see, and lack role models that would be helpful. I've already published an extreme example of how to eat adequately on very little money (£1 a day - really), and as a way out of the trap of having to borrow money for a couple of days before pay day / income support it really works. Having survived one week without paying several pounds to loan sharks, you are better prepared for the next week. Victims often say "you can't survive without loans on a poor income." The truth is very different - on a poor income, you can't afford to give money away EVER to criminals, legal or otherwise. You can't afford to do it on a regular basis, either. Having survived a week or two without loans, the next best aim is to find a high quality diet on a low income. 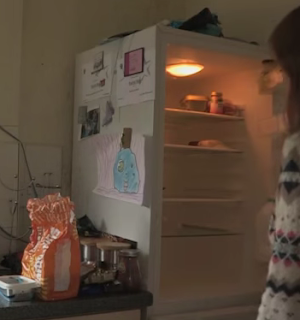 After food, poor people's most regular reason for needing an urgent loan is for energy bills. Gas is getting dearer, but electricity as a sole source of energy needs managing well. An electric cooker, especially the oven, is very expensive to run. 8 kilowatt cookers aren't unusual. That's £1.12 an hour at 14 pence per unit of electricity. I've known people say "I can't afford to buy a microwave on my budget." If you are poor and depend on electricity, you can't afford not to. Managing your money on a week by week basis continually leads to problems. Everyone needs some cash saved so that they can buy things that improve their lives - and make further savings possible. The other huge obstacle that poor people face is the barrage of adverts that blight TV. TV adverts are design to take away your money. That's their only objective. They particularly aim at children, and children depend on their parents to know what is good for them. Fried packaged advertised junk isn't. Refined sugar isn't. Fresh food is, and very often it is cheaper than the junk. Their is very little on the TV that informs people about healthy eating. Fortunately the BBC does good documentaries. It is understandable that someone living with the continual threat of debt needs comfort. Chocolate is a favourite. But the packages labelled chocolate in most shops aren't mostly chocolate (i.e. cocoa), they are mostly refined white sugar, which I could buy for 50 pence a kilo (local supermarket) so imagine how cheap it is wholesale. The good news is, you can make your own. The most difficult habit to change seems to be the belief "I can't save, not on this income". Well you can't afford to give money away regularly to loan sharks, either, but plenty of people do. I've noticed that around my area poor people may not be able to feed their kids but they still find the money to smoke. Cigarettes cost about $5-$7 per pack here. Pretty expensive 'hobby'. Smoking and similar habits are more likely in times of extreme stress. The victims need help, and better role models. Good, helpful advice to victims of debt, poverty and such often evoke extreme, even violent reactions from their peers (especially parents) who find the 'need to change' a threatening idea. Cigarettes are even dearer here; much dearer. The high levels of tax have made a significant reduction in the % of people that smoke. Consider the following fact: Since 2015, the richest 1% has owned more wealth than the rest of the planet. A recent report “An economy for the 99 per cent” by Oxfam has put the gap between the rich and the poor to be far greater than what was feared before. It has claimed that just 8 men own the same wealth as 3.6 billion who make up the poorest half of the world. The report details how big businesses and the super-rich are fuelling inequality by evading taxes, driving down wages and using their power to influence politics. Incomes of the poorest 10% of people increased by less than $3 a year between 1998 and 2011, while the incomes of the richest 1% increased 182 times. Growing inequality threatens to pull societies apart. It leads to increase in crime and insecurity and undermines the fight to end poverty. Multilateral organisations such as the World Bank have kept the twin goals of fighting poverty and working towards shared prosperity as their foremost agendas. Thousands of low-income benefit claimants are facing debt, rent arrears and eviction as a result of policy design flaws in universal credit, according to landlords and politicians, who are demanding an overhaul of the system. They have warned that UC rules that require claimants to wait at least six weeks for a first benefit payment mean many are going without basic living essentials, and forcing them to turn to food banks and (Conservative) loan sharks. Ministers are being urged to slow down the national rollout, and to increase support for vulnerable claimants struggling to cope with the demands of monthly payments and an increasingly online-only system. Eight out of 10 social housing tenants moved on to UC are falling into rent arrears or increasing the level of pre-existing arrears. Families unable to manage the regulation 42-day wait for a first payment are regularly referred to food banks by housing associations or local MPs. Some claimants are waiting as long as 60 days for an initial payment because of processing delays on top of the formal wait. Uncertainty about the system has contributed to a dramatic decline in the number of private landlords willing to take on benefit recipients, even if they are in work.